To Dorset on my day off, a six hour drive thanks to the failure of Tom Tom, the idiocy of the navigator (me), and the closure of the A303; but it was a journey well worth making. I had gone to meet David Saltmarsh, who has a smallholding near Lyme Regis, twenty five acres of organic veg, organic sheep, organic cows and organic hens, which he farms with his wife and children and the help of neighbours who have organised themselves into a kind of loosely aligned co-operative. When we arrived everyone had turned out to try to persuade a sick cow to stand on her own four legs, which she seemed disinclined to do. It is not an easy living, but David supplements his income from farming by making chairs – greenwood chairs, fashioned from newly cut oak and ash and beech grown on his own woodland, turned on a pole lathe, assembled without screws or nails or glue, a tradition that goes back further than anyone can remember. My grandfather, from just over the border in Devon, sat on a chair which his father and grandfather had sat on, a Windsor chair with a wheel carved in the slat that eventually went to my cousin and is now sat on by the seventh generation to be thus accommodated. It is Lent, and I must confess I coveted that chair (I got a fold-over mahogany card table instead) and have always wanted one like it, but thought the skills that went into making such a wonderful piece of furniture were extinct. And then I heard about David Saltmarsh, looked at his website, and found the chair which I hope will last at least the next seven generations. It is made from a single piece of oak, with pole-turned legs and stretchers, an ash seat, close-grained and carved for comfort, with a wheel cut into the central slat, and stands in my sitting room looking immensely inviting. 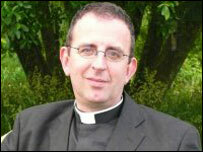 Celebrant & Preacher Fr Alan Gyle. The clergy are available daily at service times and by appointment for conversation and counsel; please ring the Parish Office on 020 7201 9999.